In yesterday's episode "Live Bait", we see the return of the Governor but not as you would have expected. Instead of continuing where we left off last week, we get to see what he has been up to since his defeat at the prison. Abandoned by his men, he journeys alone back to Woodbury which is deserted except for walkers everywhere. As such he sets the place ablaze and moves on until he comes across a family consisting of two sisters, Lilly and Tara, their cancer stricken father David, and Lilly's daughter Megan. David who is in stage four of his cancer keeps his granddaughter Megan smiling but is of no use to his family given his physical ailment. So how the family has survived so long with Lilly's husband disappearing three years ago is a mystery. Yes that sounds a bit sexist, and I know there are strong female characters in the series like Michonne and even Andrea as wishy washy as she was. The family appeared to be living off a truck just parked outside, but wouldn't they have to explore for other supplies? The reason I am saying this is because of the fact that the Governor had to explained to Lilly that the walkers could only be killed with a blow to the head. Aside from the one the Governor said they shot in the chest, they haven't encountered any others all these years? Overall, I really enjoyed this episode. 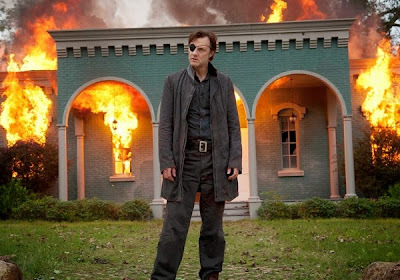 David Morrissey is an amazing actor and it's great to see him back on the show after such a long hiatus. Seeing him interact with the family shows us the "good" side of him. But of course, the viewers know that he has another side and it'll be interesting to see if and when it shows. At the end of the episode there's a bit of a reunion which will continue onto the next episode. The dynamics of the Governor has changed from one that we can't wait to see die to one that we're rooting for now. Did you like this week's episode?